NETWORK FINALS: The Final Four NCAA TOURNAMENT games on CBS adjusted to 5.5. In addition, the SNL rerun gained 0.1 in final numbers. CABLE HIGHLIGHTS: Adult Swim took the lead on a low-rated Saturday for cable. 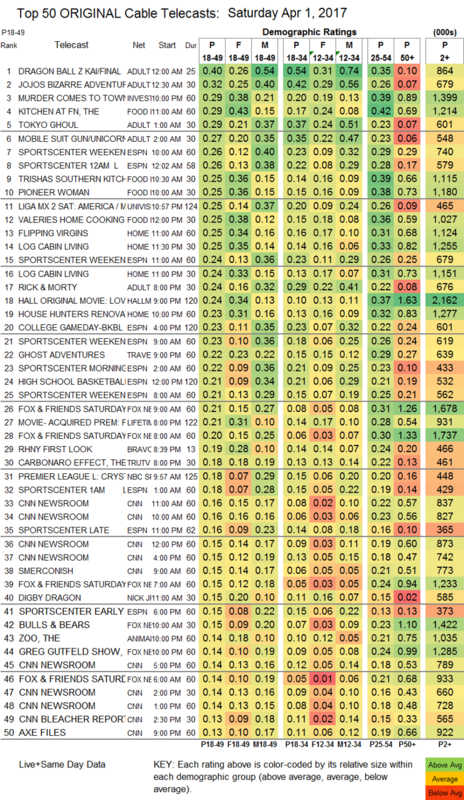 Its primetime RICK & MORTY was at 0.24, and the rest was in late-night. DRAGON BALL Z was on top despite dropping 0.14 from last week to 0.40, and almost everything else in the line-up was down as well: JOJO’S BIZARRE ADVENTURES by 0.19 to 0.32, TOKYO GHOUL by 0.15 to 0.29, MOBILE SUIT GUNDAM by 0.11 to 0.27, HUNTER X HUNTER by 0.12 to 0.29/593K, and NARUTO by 0.04 to 0.28/583K, the only exception being GHOST IN THE SHELL, up 0.01 to 0.25/492K. ID’s MURDER COMES TO TOWN was at 0.29. On Food Network, TRISHA’S SOUTHERN KITCHEN rose 0.04 to 0.25, PIONEER WOMAN was also at 0.25, and VALERIE’S HOME COOKING completed the trifecta up 0.01 to 0.25. 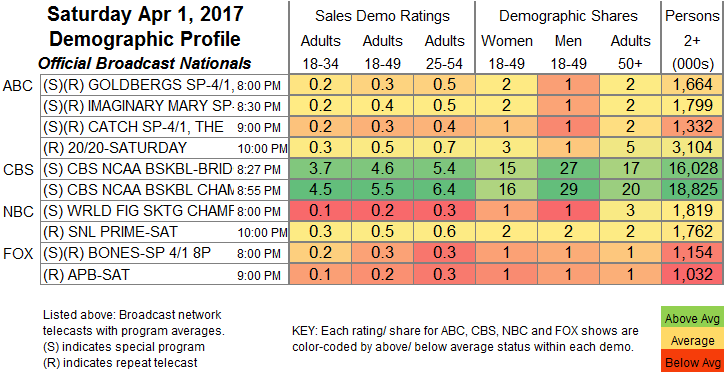 Hallmark’s movie LOVE AT FIRST BARK was at 0.24. HGTV’s HOUSE HUNTERS RENOVATION fell 0.09 to 0.23. A CARBONARO EFFECT episode on Tru was at 0.18. On OWN, FOR PEETE’S SAKE ticked up to 0.09.